It first happened around the third or fourth day after our father was shifted to the ward from three weeks in the ICU. His usual languid right side, would stiffen up, his right arm all clenched would move to his chest, his facial expression would be that of a person in utmost pain and breathing would be heavy, noisy and rapid. It was scary to say the least, to watch him have this episode all of a sudden when he was asleep peacefully. This would recur – sometimes every time 10 minutes, sometimes every half hour and on real fun days every 5 minutes. The first night it happened, he was moved back to ICU for observation. Nothing particularly seemed amiss, he was wheeled back to the room next morning. In our five month stay at the hospital, this happened every so very often. Some said our father was getting emotional. Emotional? So timed, every 10 minutes emotional? Nah. He was given steroids. Didn’t help. Was given strong antibiotics. No real help there either. Meanwhile as a parallel story, our father often was in the grasp of Urinary Tract Infection (UTI). Tests revealed he wasn’t able to void all his urine. His pre existing prostate combined with the stroke now were presenting a challenge to void urine. So he was started on Intermittent Catheterization (IMC). 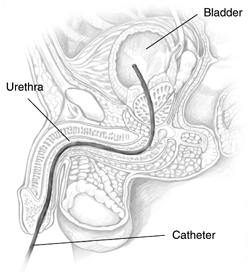 In this procedure, you insert a catheter, get all the urine out and remove the catheter. Seemed like an awesome procedure compared to having an indwelling catheter. This was done twice a day. Apart from this he passed some urine on his own. This was it at the hospital. He constantly had frequent UTIs. And then there would be nights of the breathing episode, which we termed as ‘heavy breathing’. We would be awake all night watching him struggle with the breathing. Strangely the episodes occurred mostly only during the nights. All sorts of tests were done. Was it the lungs? Something to do with ENT? May be a brain CT Scan would help? Was it the sleeping pattern? None solved the mystery, only deepened it. We obsessed about it to no avail. It always puzzled me how he would have heavy breathing all night, but would be fine in the morning. Unable to deduct an obvious cause we got him home.